Lock in a great price for La Toubana Hotel & Spa – rated 8.7 by recent guests! Setting was tremendous. Private beach the highlight. Staff outstanding and had enough English speakers. So glad we chose La Toubana. We booked a 2 bedroom suite which turned out to be a little house with all the facilities. Absolutely perfect, comfortable and well decorated. Beautiful beach and pool area,. Staff wonderful and friendly. The staff is professional and caring, the restaurant is excellent including the wines. Prices are fair and it definitely worth for dinners. Fantastic hotel with a beautiful beach. The personnel in the hotel were very nice with us and made us our holidays great. Close to the hotel we will find the most beautiful beach in the island, La Caravelle. The Spa in wonderfull specially the massages, just excelent. Très bel établissement bien intégré dans le site. Belle piscine . Plage sympa. Petit déjeuner très varié et très bon. Restauration à la piscine très bien, service parfait. Le cadre paradisiaque. Le calme. La vue sur la mer évidemment. Très bel hôtel, magnifique vue, plage superbe avec vue sur la plage de la Caravelle, Marie Galante, les Saintes. Personnel adorable. Très calme et reposant. Le top! La Toubana Hotel & Spa This rating is a reflection of how the property compares to the industry standard when it comes to price, facilities and services available. It's based on a self-evaluation by the property. Use this rating to help choose your stay! Offering amazing views of Saint-Anne Bay, La Toubana Hotel & Spa has a beautiful beachside setting. 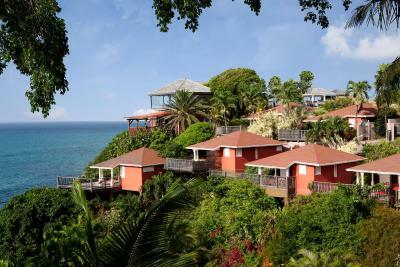 It features suites and bungalows with sea views, an outdoor swimming pool and a spa. Featuring a terrace, each air-conditioned suite and bungalow at La Toubana Hotel & Spa has bright, Caribbean-style décor. There is a sitting area with a flat-screen TV and a kitchenette. 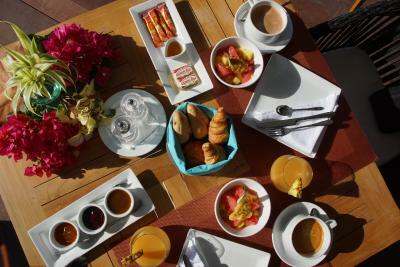 Creole cuisine is served in the beachfront Le Grand Bleu Restaurant. On the Beach has lighter dishes, and Bar de la Mer serves cocktails overlooking the Caribbean Sea. La Toubana’s Océan Spa offers beauty treatments and massage. There is also a gym and a relaxation room. The hotel is in a peaceful setting just over half a mile outside Saint-Anne. Pole Caraibes Airport is 12 miles away and Pointe-à-Pitre can be reached in 20 minutes by car. When would you like to stay at La Toubana Hotel & Spa? Offering sea views from its terrace, this air-conditioned bungalow has bright, Caribbean-style décor. There is a bedroom with a king bed or 2 single beds, a sitting area with a flat-screen TV and a kitchenette. Offering sea and garden views from its terrace, this air-conditioned suite has bright, Caribbean-style décor. There is a bedroom with a king-size bed or 2 single beds, a seating area with a flat-screen TV. This suite has a balcony, bathrobe and kitchenware. This suite features a balcony, bathrobe and microwave. This bungalow offers sea view and is equipped with air conditioning. House Rules La Toubana Hotel & Spa takes special requests – add in the next step! La Toubana Hotel &amp; Spa accepts these cards and reserves the right to temporarily hold an amount prior to arrival. La Toubana Hotel & Spa accepts these cards and reserves the right to temporarily hold an amount prior to arrival. Restaurant menus in the restaurants were a bit limited. We hired a car and lots of good restaurants locally. Dirty rooms, a lot of hairs at floor, unprofessional staff, we are traveling with the dog and nobody told that it’s cost 50€ per/stay. This information comes only in final bill. Breakfast is terrible. My wife has omelet with hairs, and me has problems with stomach next 24h. At two occasions either the restaurant and the beech were privatized for special events which we were not aware of. Lights were insufficient to walk from our bungalow to the facilities. For the breakfast, even though I had sent an email one week before with my allergies, there was nothing for me apart from fruit. Normally the hotels find special bread or make pancakes... especially at this price. Hotel dining could have been better.